“Doink”. Next. “Deenk”. Next. “Dwo-wo-woink”. This will be a familiar procedure to anyone who plays a synthesiser or makes music on a computer; and, my goodness, there are a lot of us these days. “Brrrr-b”. Next. “Br-ru-rub”. Next. “Piaowww”. It’s the interminable scroll through preset sounds, a tedious search through the synth’s pre-programmed noises until boredom sets in, at which point you just settle for the least worst option. “Piaowww”. Yeah, that’ll do. “Piaow piaow piaow piaowww.” I have to admit that I’m getting tired of “piaowww”, and of the musical path that inevitably leads me to choose “piaowww”. Still, I guess it sounds all right. Let’s move on. But wait. Maybe I’m not really a synth player at all. Sure, I play the black and white keys with my fingers and pleasant sounds come out, but those sounds have been approved by manufacturers. There’s an industry devoted to creating endless presets for us to choose from, the assumption being that we’re too lazy to bother creating sounds from scratch or to explore the capabilities of the instrument. It’s a fair assumption. Synthesisers today, whether balanced on keyboard stands, mounted in racks or installed on computers, are insanely powerful tools of musical creation. Countless sound sources can be manipulated in infinite ways via ludicrously complex interfaces; they’ve almost become too powerful. As a result, they barely have their surfaces scratched by the millions of people who use them, including me. I choose a sound, I play the notes, so my input into the musical equation is limited to what key I press, how hard and for how long. Essentially, my fingers are inputting digital information into the synth – a job that could be done far more accurately by a computer, or even by the synth itself. I am redundant. This surely isn’t what electronic music was meant to be about. After all, the word synthesiser is taken from the Greek word for composition; it should be synonymous with invention, creation, exploration. But with their surge in processing power, synths have suppressed the spirit of invention rather like the home computer. In the early 80s you could become the master of the ZX81 or the Commodore 64, discovering all its capabilities by programming, hacking and playing with it. Today, there isn’t a person on the planet who knows everything about the computer I’m typing this on. Benign software packages sit between us and the computer’s awesome power, directing us to use it in certain, approved ways. The computer, and by association the synthesiser, is in control. The Oramics to Electronica exhibition at London’s Science Museum leads me through the electronic sound experiments conducted by musician and composer Daphne Oram in the 50s, in which a playful freedom collided with scientific rigour and musical experimentation; her work eventually led to the establishment of the BBC’s Radiophonic Workshop, a unit producing sound effects and new music for radio and later television. In all the exhibited photographs of pre-synth pioneers at work in the studio, manipulating tape, primitive electronics and home-made effects, there’s an intensity and pleasure on their faces which stands in stark contrast to my own expression as I scroll wearily through presets in my own home studio. Something has evidently been lost. I want that spirit of discovery back; that feeling of excitement about what electronic sound can do. “It’s a bit grumpy this morning,” says London-based musician Dave Ross. He’s trying to coax sound from a disparate collection of electronics he’s connected together inside a suitcase. As a ferocious, seemingly uncontrollable tone emerges from the speakers, he reduces the volume and explains, “This is a VCO, or a voltage-controlled oscillator.” He points to a single knob. 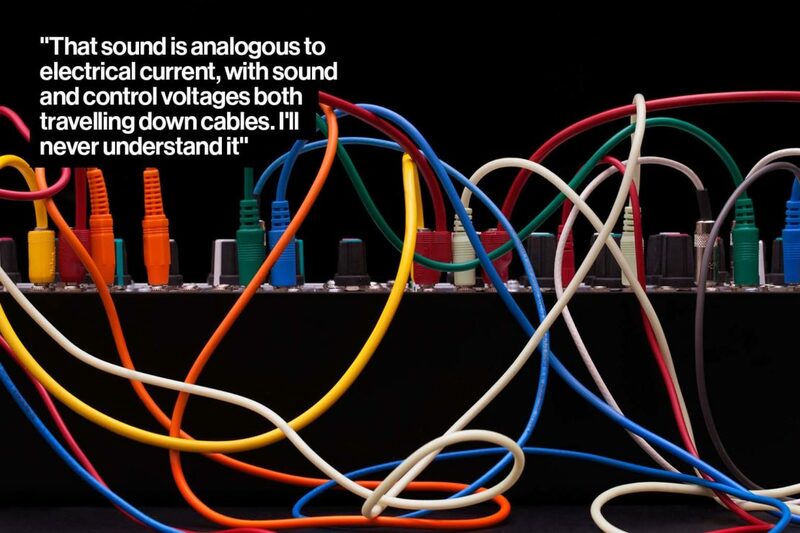 “It’s a cornerstone of synthesis. A waveform is generated, perhaps a sine, square or triangle wave, which is affected by applying a voltage to it.” There’s no keyboard in Ross’s suitcase; that single knob minutely adjusts the frequency of the waveform and thus the pitch of the note, allowing you to explore the exciting space between B and C, or D and E flat. Ross guides me round the rest of the suitcase, pointing out the multicoloured patch cables that pass the voltage from the VCO to other parts of the system. Can music provide the key to treating dementia and other traumas? Fair re-use? This principle has fascinated us ever since Léon Theremin first produced a wild, eerie sound from the instrument that bears his name back in 1919. The Theremin is the most basic synthesiser of all, operated by the movement of the player’s hands in the air; two antennae sense the movement, one hand controlling the frequency (or pitch), the other controlling amplitude (or volume). Theremin’s work inspired many experiments with musical electronics over the next 40 years, but these were largely confined to well-resourced laboratories that could afford the expensive vacuum tubes used to make the oscillators. The first programmable synthesiser, the RCA Mark II, was installed (and indeed bolted to the concrete floor) at Columbia University’s music studio in 1957 at a cost of $125,000. Back then, even a single oscillator could cost as much as $400 (more than $3,000 today). But the invention of the transistor in the mid-50s changed everything. Two pioneers, Robert Moog and Don Buchla, seized that opportunity, developing instruments that changed the way we make music. Transistors were cheap. While it took many years for synthesisers to become affordable, transistors would swiftly democratise electronic music-making. 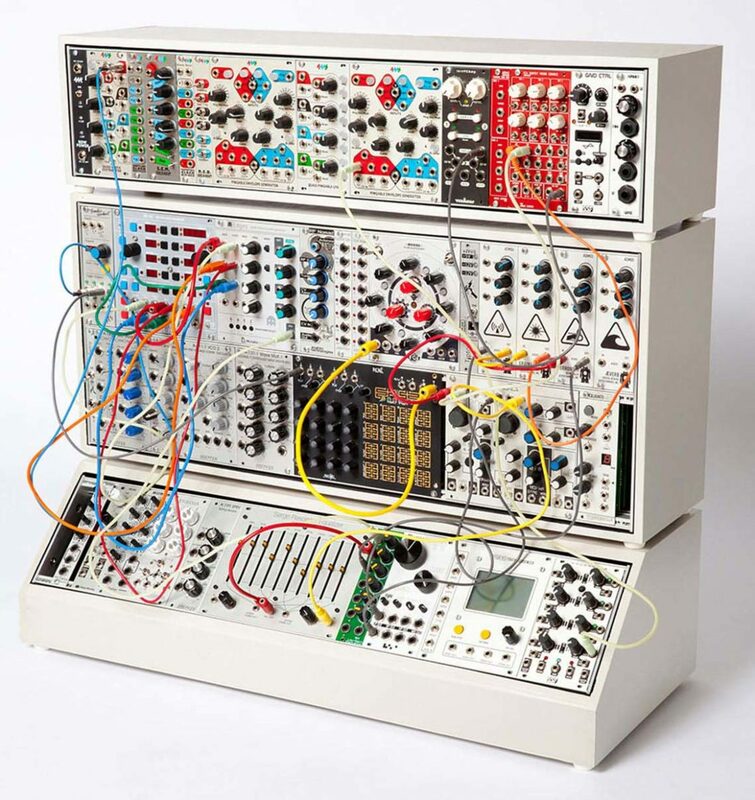 The huge modular systems developed in the 60s, and subsequently used by the progressive rock acts of the 70s, would give way to more compact units which, by around 1980, were cheap enough for punk-inspired musicians to start experimenting. All the instruments in a traditional rock band could now be replaced by synthesised equivalents. Pioneering digital synthesis took this even further during the 80s, making it harder to tell the difference between the real instrument and a synthesised version. You effectively had a band in a box, and that emulation (as opposed to creation) would end up taking over in a way that Moog and Buchla could never have envisaged. Even by the mid-70s, as the public’s enthusiasm for such prog rock keyboard heroes as Keith Emerson and Rick Wakeman was on the wane, synthesisers were still priced way too high for most punk musicians. “In 1977 I paid $1200 for my first EML synthesiser,” recalls Robert Wheeler of American rock band Pere Ubu. “That was a huge amount of money, and I wouldn’t have been able to afford it had I not been in a bad car accident where the settlement just about covered the cost.” The Polymoog Keyboard 280a, whose string sound became famous in Gary Numan’s Cars in1979, cost $3995 (around $15,000 today). No wonder magazine subscriptions and reservoirs of patience were seen as a more realistic route to electronica; Chris Carter from experimental band Throbbing Gristle largely worked on homemade instruments, while Joy Division’s first synth, a British kit synthesiser called the Transcendent 2000, was built by Bernard Sumner over several months. This enthusiasm hasn’t gone unnoticed by bigger synth manufacturers. Korg, whose early machines fuelled the critical success of electronic and post-punk bands like The Normal and OMD back in the late 70s, are working with New York-based electronics firm littleBits to make a small modular system that demystifies the traditional analogue synthesiser. The Radiophonic Workshop, revived by the BBC as an online venture, is also collaborating with littleBits to make a Radiophonic Workshop in a suitcase for kids. Once again, we’re being encouraged to play with sound. 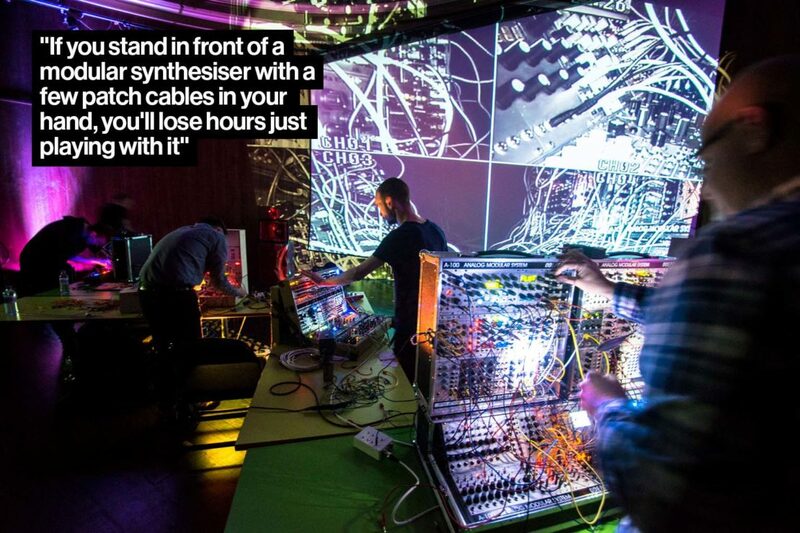 “Playing a synthesiser should be just like singing,” says Dave Ross. “It’s a thing going on with the brain and sound. Whether or not you’re musically trained to play or understand harmony, everyone has emotive feelings surrounding music, and synthesisers can give you that immediate response.” He turns one of the knobs in his little suitcase, and the sound we’re listening to shimmers slightly. “The right point might not be there,” he says, twisting it, “but it might be there. You couldn’t say why, or explain it. But you learn from it. You learn from the music. And if you spend enough time with it, you really start to feel it.” As we continue to turn knobs this way and that, the “piaowww” of my computer seems a million miles away.